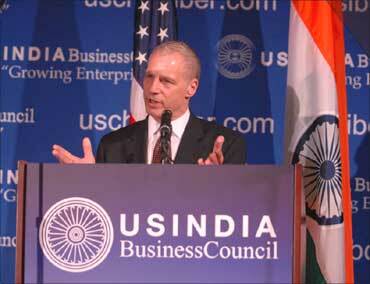 Rediff.com's Aziz Haniffa reports from Washington, DC on the US-India Business Council's 35th anniversary event. Last July when United States Secretary of State Hillary Clinton visited India and launched what she described as US-India 3.0 -- envisaged at taking the strategic partnership between the two countries to an even higher level -- her first stop was not New Delhi but Mumbai to meet with Ratan Tata, Mukesh Ambani and other leading Indian industrialists. External Affairs Minister S M Krishna did exactly the same thing when he met American businessmen prior to the US-India government to government Strategic Dialogue, which he was chairing with Clinton. In a keynote address to the US-India Business Council, which celebrates its 35th anniversary, Krishna, recognising the vital role industry plays in shaping the policy of governments, said it is "the contribution of many pioneering entrepreneurs like those present here today, who have built the strong resilient edifice of the India-US bilateral economic partnership." He said it was their "vision and leadership," that had "achieved a mutually beneficial synergy that bridges distances, spans the oceans and lie between us and enriches the bilateral discourse in a way that was not imaginable 35 years ago." 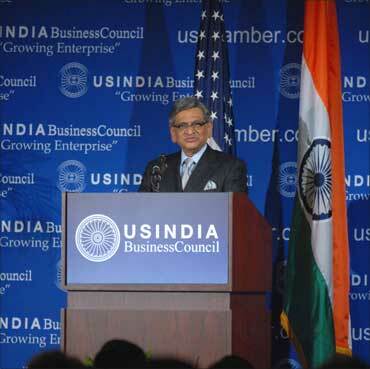 Image: External Affairs Minister S M Krishna addresses the USIBC's 35th anniversary gala. Krishna, a Fulbright Scholar and an alumnus of the South Methodist University in Texas, recalling Prime Minister Manmohan Singh's address to the USIBC when he visited Washington last November, said, "In today's economically integrated world, economic relationships constitute the bedrock on which social, cultural and political relationships are built." Thus, he argued that "the India-US example, similarly, draws its strength not merely from engagement and understanding between governments, but from the vitality of private partnerships and the warmth of ties between our peoples." Krishna then wasted no time making a strong pitch for more US businesses to invest in India, declaring that if the 20th century was a century of capital accumulation, the 21st century would be the century of innovation, and that India is a "global hub for innovation, design and development and manufacturing." He then cited several examples of how India's corporate sector was a key player in the country's innovation initiative, including the Nano, where the Tatas saved production costs with their 'design to cost' strategy, by challenging its vendors to come up with supplies under pre-set price caps, and Titan, producing the world's slimmest water resistant watch, "and I believe the Swiss were impressed." 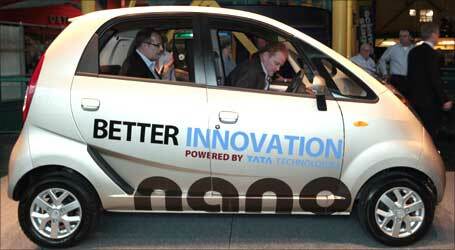 Image: Journalists admire the Nano at the Science Centre in Detroit, the US auto hub, January 14. "A product like the small car or a portable low cost ECG machine are powerful examples of global capabilities applied to local needs, and have great potential in other markets," the external affairs minister, a former chief minister of Karnataka, said. India, Krishna said, is an ideal place for innovation "which depends on technology and a broad based and diverse spread in all sectors of the economy and market." "A growing number of patents of US companies are coming out of their Indian operations," he pointed out and argued that "the nature of our business ties has brought people together in an unprecedented manner that has had a profound impact on the overall relationship." Krishna said he had "observed the transformation at its earliest stages from close quarters as chief minister of Karnataka." He predicted that as the Indian economy grows, as the global economy recovers and the US economy regains its momentum, "our trade and investment figures can multiply exponentially." But Krishna exhorted, "We must go beyond that, make innovation the defining principle of our cooperation, and achieve its true potential." 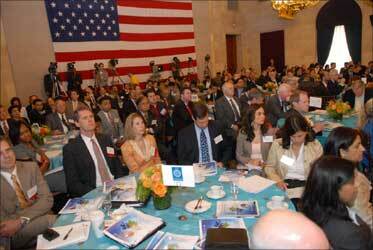 Image: The USIBC event in Washington, DC, June 2. The minister pointed out that Indian and American businesses have a proven track record of partnership in innovation, from civil nuclear cooperation to the Chandrayan space mission. "The bonds between our engineers, scientists, entrepreneurs and innovators can make a major contribution to shaping the 21st century in every area of human endeavour -- in science, in tracking monsoons, for warning of natural disasters, guiding cultivators and farmers with environment predictability, crossing frontiers in e-learning, e-health and bringing about the e-revolution that one had only imagined a few decades ago." Quoting the late management guru C L Prahalad, Krishna said, the prospective rewards would be "growth, profits and incalculable contribution to humankind." Krishna then went down memory lane, reminiscing about his student days in the US, saying, "As a young law students in America who witnessed the historic Apollo launch to the moon and having personally expedited the IT revolution in Bangalore, I am absolutely confident that the emphasis, going forward, must be on the India-US partnership in high technology cooperation and innovation that will generate prosperity for both our peoples in the years to come." 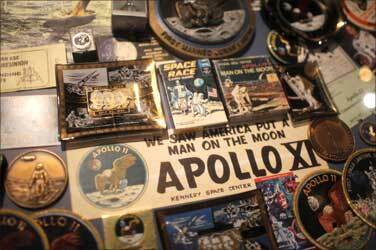 Image: Apollo 11 souvenirs at the US Astronaut Hall of Fame in Cape Canaveral. "Indian importers have a 100 per cent compliance record when it comes to safeguarding imported technology," the minister said and pointed out that "we have been implementing the End-Use Verification Agreement with US partners for years now, and have, last year, agreed to a Technical Safeguards Agreement in space cooperation." Krishna said India also had reached a End Use Monitoring arrangement for defence acquisitions and added: "We have given a number of written assurances that US technology will enjoy the level of security stipulated by the relevant US laws and not be diverted in contravention of US regulations." "With this background and the trust that we have built as strategic partners, we should be able to create an environment for a robust two-way trade in advanced technology products," he said. Assuring US businesses, under the USIBC's umbrella that lobbied vigorously for the passage of the US-India civil nuclear agreement in the United States Congress, Krishna assured the audience that besides being well within the agreed timelines for the implementation of the agreement so that US industry can get a chunk of the civil nuclear market pie in India, "the government is committed to put in place a nuclear liability regime." 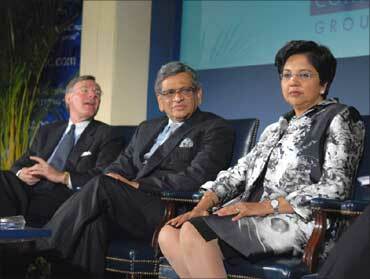 Image: From left,Terry McGraw, Chairman, USIBC, S M Krishna, PepsiCo Chairman Indra Nooyi. Obviously buoyed by Krishna's remarks, Ron Somers, president, USIBC, warned those present that business and industry must lead because "if we leave the partnership solely in the hands of the government, then we risk a quid pro quo relationship. Then bureaucracies will continue to give the other country importance only insofar as that country is helpful on certain issues." "Put another way," he said, "if one country fails to be helpful, then so be it -- chalta hai! Relations will be cordial, but less than spectacular." "Industry must not let that happen," Somers said. "We must exhort our governments, our bureaucracies to think of the larger vision to align these two great democracies in the 21st century." "We must ensure that President (Barack) Obama's upcoming visit in November, yields deliverables and we must take up from there and keep delivering. All industry must be involved," he added. Image: USIBC President Ron Sommers addresses the event.